The other day I was scrolling through my social media channels when I came across an eye-opening video that featured world-renowned chef Jamie Oliver. He was speaking to a classroom of first grade students and asked if they could name specific vegetables; unfortunately, the majority of kids couldn’t identify them. Beets, cauliflower, and eggplants were all foreign objects to them. One kid even thought that a tomato was a potato. The video made me think: “What vegetables don’t I know about?” I know my basic vegetables, but this question came full circle when I started getting community supported agriculture (CSA) boxes from my local farmer. Each week, the CSA box delivery is like getting a present for the holidays. The contents of the box are listed on a sheet of paper and include a variety of healthy vegetables, including onions, cucumbers, carrots, zucchini, and tomatoes. However, I soon became educated about some other deliciously fresh (but rather unknown) ingredients inside the box. 1. 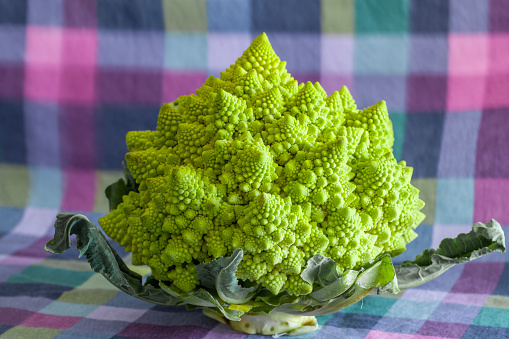 Romanesco cauliflower: The most visually appealing vegetable from the CSA appeared to be a green alien spaceship—romanesco cauliflower. It is also known as Roman cauliflower or romanesco broccoli—and some people believe it is a creation from selective breeding. Romanesco is from the Brassica oleracea family, which also includes cauliflower, broccoli, collard greens, Brussels sprouts, and kale. The romanesco cauliflower is in season from the late summer to early fall. They are also packed with nutrients, such as carotenoids, fiber, vitamin C, and vitamin K. To cook it, steam it for about eight minutes—just like you would steam regular broccoli or cauliflower. 2. Kohlrabi: Kohlrabi is also from the Brassica oleracea family, and you can find them in green or purple. They are also known as turnip cabbage or German turnip; however, it is not a root vegetable. Kohlrabi is considered a very versatile vegetable, and they can be eaten raw. (Try adding it to your salad.) I also enjoy them roasted, baked, grilled, or steamed. It is best to peel the outside skin before you cook the kohlrabi vegetable. Kohlrabi is usually in season in the summer. This vegetable is loaded with vitamin C, vitamin B6, manganese, potassium, and phosphorus. 3. Ramps: Ramps are a delicious herb that I discovered during one of the first CSA boxes in the spring. The plant name of ramps is allium tricoccum—they are also commonly known as wild leek, wild garlic, or spring onion. They remind me a lot of a green onion, but they taste like garlic. In the U.S., there are many festivals dedicated toward ramps, and they are a perfect addition to cooking. They are great in pesto, soups, or salads…I even add them to my morning smoothies. They can also be pickled or baked in biscuits. 4. Okra: Okra is another weird looking vegetable that I found in a CSA box. Okra, also known as the lady finger of the veggie world, is usually in season from May to September. When I saw it, I had no idea what to do with it. I later learned that to prepare okra, your first have to trim the stem end and remove the fuzziness with a paper towel. You can also soak the okra in vinegar for 30 minutes to prevent the vegetable from feeling slimy. Then rinse the okra and chop it in equal pieces before baking or roasting. Okra is perfect for casseroles or stews, and it is a good source of folate, vitamin C, vitamin K, manganese, magnesium, vitamin B6, and vitamin B1. The vegetable is also known to promote healthy skin, help treat kidney disease, and prevent diabetes. 5. Tomatillo: Tomatillo is in the same family as the tomato; however, it is small and green, and you have to unwrap it from its thin papery husk. They are great for salads and homemade salsa or guacamole, but they actually taste better when steamed, boiled, or fried. Tomatillos are considered a good source of vitamin C, vitamin B6, potassium, magnesium, and fiber. The best time to enjoy tomatillos are during the late summer to early fall. What are some other vegetables or fresh herbs you have not discovered yet? Farmer’s markets and CSA boxes have also introduced me to healthy vegetables such as Jerusalem artichokes, fennel, angelica, and daikon radish. It is amazing what nature can offer when you put away processed foods and take a real interest in healthy vegetables. The next generation of food eaters depends on it! Jeanroy, A., “Ramps – What Are Ramps?” About.com; http://herbgardens.about.com/od/culinary/p/Ramps-What-Are-Ramps.htm, last accessed July 31, 2015. Barrett, M., “Over 6 Health Benefits of Okra, Plus Growing Tips,” Natural Society web site, February 11, 2013; http://naturalsociety.com/6-okra-health-benefits-growing-cooking/.